Carvalhais, Miguel. Artificial Aesthetics: Creative Practices in Computational Art and Design. Porto: U.Porto Edições, 2016. 307 pages. ISBN 978-989-746-092-0. This is a study of the use of computational systems in design and the arts. As computers and computational systems become ubiquitous and of increasingly cultural and economic significance, they have been contributing to dramatic changes in the media and in the work produced on, with, and for them. Not only they allow the production of artefacts that can be as grand, dramatic, deep and moving as any, as they also manage to communicate in singular and unique ways, made possible by their procedural nature. Artificial Aesthetics studies these artefacts, their procedural properties, and the role they play in the emergence of new modes of authorship, creation, and aesthetic enjoyment. I currently work with a Design Research Group that, up until recently, answered by the name “Media and Perplexity”; it has now been re-named “Center for Unexpected Media”, since we found the former designation slightly cumbersome as a visiting card in academic and scientific circles. Yet the term “Perplexity” remains at the center of what we have been tapping into: how in these early days of the Twenty-First Century, the core translations of our existential journey seem to be continually undergoing a radical paradigm shift that is, for all purposes, a violent process. This violence may be quite literal in specific instances, particularly in the polarised semantics of mass media (hilarity versus gravitas, euphoria versus catastrophe), yet it is fundamentally an ontological violence, a violence exerted over the being that struggles with how new media, emancipated from linearity of purpose, become particularly (and paradoxically) apt at self-perpetuating our shortcomings in a spiral of collective, compulsive psychoanalysis: hallucinatory, sensual, endorphin-driven, obedient — but more scarcely contributive to our fundamental need for harmonisation. Uprooted from mythological archetypes, new media emerge as a master of paradox: devoid of a template, devoid of a consensual grammar, they become a non-contradictory accumulation of opposites, an endless, self-driven exercise in speculation. None of this is necessarily fatal, we may observe, but it demands a fundamental re-consideration of the most basic assumptions regarding the creative and communicative act. And how to decipher it, so that it regains its clarity of purpose, its sense of contribution. When Miguel Carvalhais contacted me for the first time, back in 2009, requesting a meeting I had mixed feelings. On the one hand, I was really curious to know why someone from the Faculty of Fine Arts of the University of Porto wanted to talk with me. On the other hand, I was slightly worried, and afraid that it could be a total waste of time. I had been working on the intersection between the domains of Artificial Intelligence and Computational Art for approximately twenty years. Throughout that time, I had contact with many artists that were deeply interested in computers and technology, however they were profoundly unenlightened regarding the true nature of computation, its limits, and its potential. Frequently, they saw the computer as an awe-inspiring mystical device, governed by some sort of magical rules. Truth be told, the same can be said about many computer scientists, even the ones working in computational art, that are profoundly unaware of the true nature of Art and Design. As usual, curiosity prevailed, and I quickly discovered that Miguel was one of the rare individuals who combine a thorough understanding of Art and Design with technological knowledge and skills, allowing him to make a profound and meaningful contribution to this innately multidisciplinary area of research. Later, together with Heitor Alvelos, I had the pleasure and honour of becoming his PhD supervisor of the thesis Towards a Model for Artificial Aesthetics: Contributions to the Study of Creative Practices in Procedural and Computational Systems, which Miguel defended in 2011. For the above reasons it is with great joy that I see this book come to light. We live in a world where computers and other computational devices are ubiquitous and play an increasingly important role in our daily life. We also live in an era where the debate regarding the promises and dangers of the emergence of intelligent machines has left the realms of science fiction, to become an inescapable and pressing matter. Let me be clear: I am not saying that robot overlords are going to take over the Earth and enslave humankind. But I subscribe the views of Stuart Russell, regarding the need to ban the development of autonomous weapons and move towards provable benign Artificial Intelligence systems. Moreover, as Miguel points out, computational devices are “fundamentally changing the media and the work produced on, with and for them”. In the same way that we are able to generate autonomous computational agents, we are also able to generate autonomous artefacts that may have the same degree of freedom as human artists and “that ultimately have the capability to create themselves, to generate new messages and artefacts on their own”. 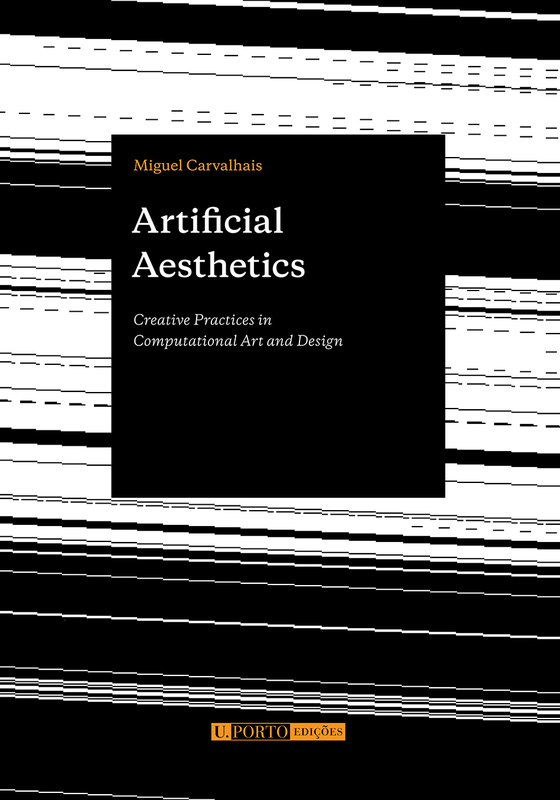 In this authoritative book, Miguel establishes the foundations to study, understand and work in the complex and multifaceted area of Artificial Art and Design. He also does it in a way that is suitable and valuable for Artists, Designers and Computer Scientists. The book starts by establishing the necessary theoretical foundations regarding computation, framing them in the context of the creative practices. This involves considering: the computer as a tool, as a medium, as a metamedium; abstract machines; descriptive and generative processes; computational equivalence and computational classes; determinism, predictability, randomness. It also involves reflecting about Computational Creativity, which, unavoidably, takes us to the Strong vs. Weak Artificial Intelligence debate (i.e., in simple terms, the difference between being intelligent and acting intelligently), and also to the realm of Artificial Aesthetics. These reflections set the tone for reasoning about Creative Systems, Creative Human-Machine collaboration, Procedural Authorship, Ergodic Literature and Ergodic Media, which conclude the first part of the book. The second part of the book begins with an historical perspective on Procedural Practices in art and design, including a much needed, and often forgotten, overview of pre-computational procedural practices in these fields. Next, Miguel establishes a fundamental division between two types of systems: those where the system’s behaviour, choices, and creations are generated by itself; and those where these actions depend on external data. This sets the tone for the final chapter of the book, where, informed by the reflections presented on previous chapters, Miguel presents an analytical model for procedural systems. This expands Espen Aarseth’s typology of textual communication, generalising the variables proposed by Aarseth, and introducing new variables, able to cope with the broader range of classes of artefacts under scrutiny. The theoretical discourse is accompanied by the analysis of a wide and varied set of works, which illustrate and inform the theoretical contributions. As a whole, I consider this book to be a vital and structuring contribution to the area, establishing the fundamental foundations and terminology necessary to all who are interested or work in this field. What Makes Digital Media Unique? Buy it online at Wook.